By design, the “why” of the birds’ suddenly lethal change in temperament is never explained, and that works out for the best. You are left free to project whatever rationale you’d like, making it a more personal and plausible tale. And trust me: by the end credits, you’re thinking twice about having that bird feeder on your back patio. Over the years, much has been made of the movie’s lack of a music soundtrack, substituting instead an eerie cacophony of bird squawks and cries. As the tension builds over its 2-hour runtime, the viewer can almost feel the birds watching them, waiting for an opportunity to attack. And when they do, the overwhelming sound makes you want to cover your head and run for shelter. Actually, that palpable urge creates a tremendous sense of claustrophobia. It becomes quickly obvious that the only safe place from the flying onslaught is to be barricaded inside, or caged, an ironic twist on the normal relationship between bird-&-man which is repeated throughout the film. Personally, my sense of isolation was likely more severe than intended, since I also found each of the characters completely unsympathetic, a true rarity for me with a Hitchcock film. I was scared in their stead, but I wasn’t scared FOR them. Melanie (Tippi Hedren) is certainly attractive, but comes off as unappealing and rather high-maintenance. I honestly can’t fathom why Mitch is interested in her. 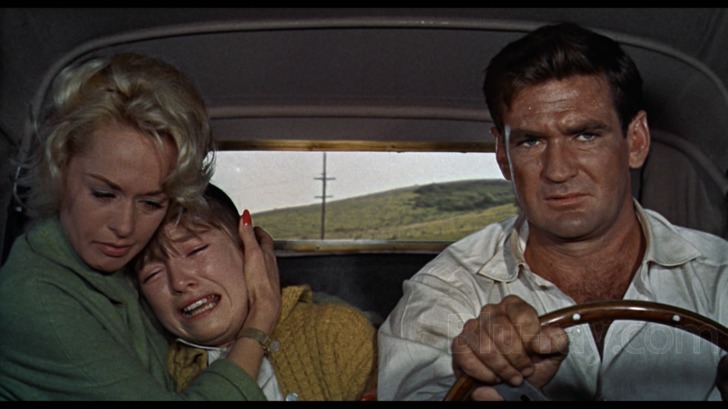 As for Mitch (Rod Taylor), he’s at once a mama’s boy and kinda smug: not an attractive combination. I don’t have anything against Annie (Suzanne Pleshette), but that may be more a product of latent good vibes from her role in the old “The Bob Newhart Show” as much as her character here. Mitch’s mother, Lydia (Jessica Tandy), doesn’t want to let Mitch “spread his wings” &/or “leave the nest”, so to speak (…sorry, I couldn’t help it). We eventually learn that Lydia sabotaged Mitch’s pre-movie-timeline relationship with Annie. Thanks a bunch, Mom. And even the kid, Cathy (Veronica Cartwright), is more pathetic than pitiable. Frankly, I found her annoying. Case in point: normally in a thriller/horror/suspense movie, I’m yelling, “Stay inside! !”, or “Run!”, or “Don’t go in there! !” at the screen, out of concern for the characters’ well-being. Yet as much as I enjoy and appreciate this film, whenever I watch it my attitude is more like “Yeah, go ahead: walk right on into the room where the birds almost undoubtedly are hiding. Go on! What’s the worst that could happen?…”. But no matter: regardless of my antipathy towards the actors, or maybe partially as a result, their beaked adversaries are flat-out terrifying. 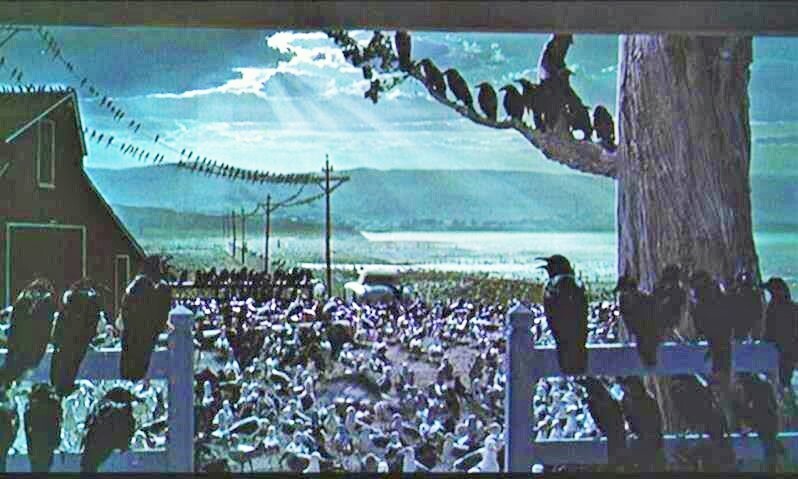 My choice for scariest scene is fairly early on, when hundreds upon hundreds of birds menacingly encircle a school building. What on a normal day would be an odd curiosity becomes a symbol of absolute doom. Remember that feeling of claustrophobia I mentioned earlier? It’s never higher than right here. There are other great scenes, of course: outside of a diner, when a bird attack causes a gasoline explosion, and Melanie is trapped inside of a glass phone-booth. Another attack occurs indoors, when birds gain entry via a chimney. And near the end, when the house is inundated with wave after wave of birds trying frantically to get inside, literally all night. As well as these hold up today, they must have been mind-blowing when seen over 50 years ago. 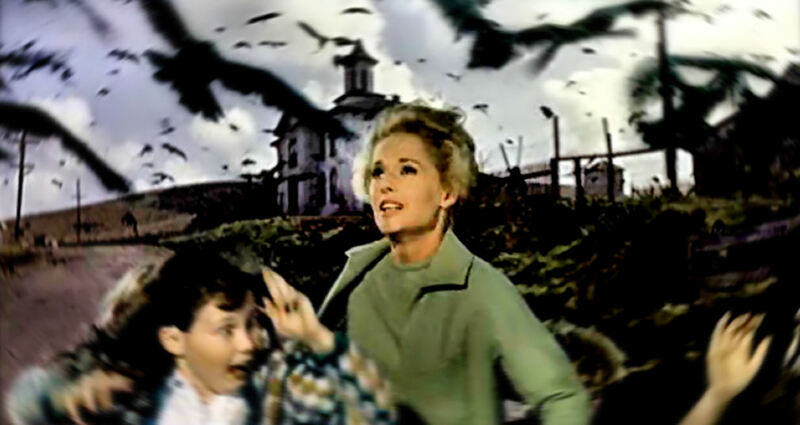 The Birds ends without a resolution, as the survivors trade one makeshift cage (the boarded-up house) for another (a car) and warily head for what they hope to be salvation. But even as they slowly drive away through a sea of birds, you’re certain that there’s nowhere on Earth they can go to ever be truly safe again. 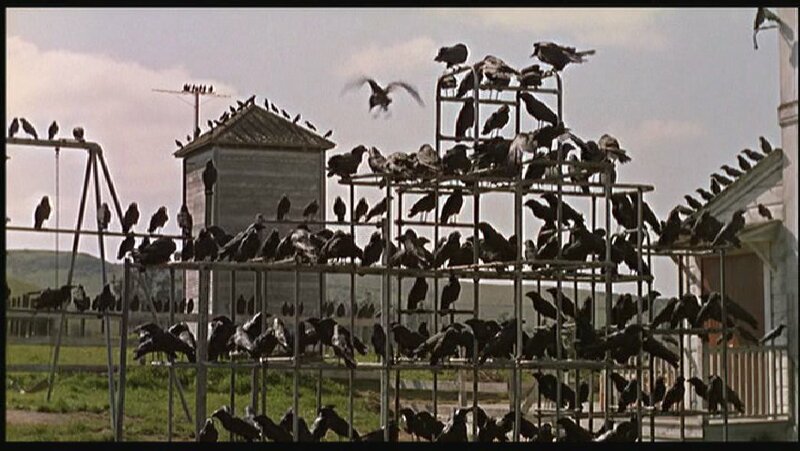 The birds are going to win, apparently, which is what ultimately makes The Birds an unsettling and timeless classic. **Our sincere thanks to Kristina at Speakeasy, Ruth at Silver Screenings, and Karen at Shadows & Satin for creating and organizing this 2nd Annual “Great Villain Blogathon”!! Very good review, JTR. You brought out some points I haven’t thought of before. Although I’ve seen this film once before, it’s been many years (decades?). I don’t personally recall that there was no music soundtrack, which is interesting, because I’ve seen other films where I felt the soundtrack detracted from the films instead of adding to them. You’ve got me wanting to give this one another look soon – thanks! It’s definitely worth a second look, as it takes something so harmless and infuses it with incredible malice. The fact that Hitchcock did this with 1960s film technology makes it that much more impressive. Enjoy, and please let me know your impressions after you watch it again…. These old Hitchcock films are my favorites, and I’m walking my sons through all of them. Next up is “North By Northwest” or “The Trouble With Harry”. Probably gonna wait another year for “Psycho”, though: it’s kinda intense. And as far as the odds go: they are, brudda. He was IN the movie? That’s pretty cool, Teach! And you MUST see the film: it’s a classic for a reason, I promise. This is a terrific review! You’re so right about the claustrophobia in this film and the fact that humans (rather than the birds) are the ones who are “caged”. I first saw this movie several years ago and felt rather unsettled by it. The next morning, I was riding my bike when I passed a bush and startled nearly a dozen birds sitting in it. They immediately flew into the air and I let out a terrified scream…then felt like a complete idiot. So your point about not really trusting birds ever again is well taken. Thanks so much for joining the blogathon with a look at these scheming, untrustworthy, feathery villains. I’m humbled and delighted you enjoyed my write-up, Ruth. Thanks so much for letting me join in on the fun…! It was a brilliant idea to write about the birds as the villains…because, of course, they are. I will be sharing your post later this evening via Twitter. Your Twitter handle is “@925screenings”, correct? I first saw this movie on TV when I was 8 years old, and it scared the bejesus out of me. Excellent review! Delighted you enjoyed it, TLN! I saw it as a child, as well, and it freaked me out. Birds have never seemed quite so innocuous to me, ever since. Oh, and the reason for the sudden multitude of birds? That one’s obvious: Global warming. Duh. Thanks, Sis! Yes, Mom did enjoy Hitchcock films, which was kinda weird since she hated being scared. I’ve never read the du Maurier story, and really should. I fear that it won’t measure up to the movie, but I kinda owe it to myself to at least give it a shot. Thank you for this most unique contribution to the blogathon! I greatly enjoyed your take on this classic. As I told your two compatriots (Ruth & Kristina), you’ve all done a fantastic job with this Blogathon once again this year. I’ll be sure to be back again…. What a great review! You brought out so many points I had never thought of such as the people being the ones that are caged. I saw this when I was little and then again recently. It is certainly a movie that sticks with you. I agree that the movie doesn’t make you like the characters very much. And it does make you want to take down your bird feeder. That made me laugh! Thanks for a very enjoyable post! Thanks so much for your kind words, Shari! I’ve always been a huge Hitchcock fan, and this may be the ONLY one of his films where I don’t like the characters. But the rest of the film is so good, it doesn’t detract from the movie, at least for me. So glad you enjoyed it…! Excellent review–I admire the hell out of this movie and have watched it twice, once in my teens and again about ten years later. Never again. There is something about these old, scary classics that makes them too, well, scary–I think it’s the understatement. If a director made this today there would be long glimpses of gratuitous flesh eating–including the obligatory bird with an eyeball, still trailing strings of ick. That’s bad, but our own imagination is worse. I compare this to Night of the Living Dead–a wholly different thing, but the same sort of technique: what we don’t see is even scarier than what we do see. Thanks, Chuck! No question that any remake of this would be far more graphic, and probably needlessly so. Hitchcock could make your pulse quicken without seeing anything: most directors nowadays just go for the gross-out factor. A robin on the front lawn makes me smile. Walking under a tree with birds in it makes me uneasy. It has been that way for years. I blame Hitch. 1 robin on my lawn? Hey, that’s cool. Brilliant recap. You touched on the biggest issue with this film for me- characters you don’t care about. If you don’t care about their fate, it makes a movie feel like a waste of time. Creepy to be sure, but you watch less out of fear and more out of curiosity of how it will resolve. 😉 Great blog. Yeah, not really caring about Tippi, Rod, and Company made it a much different experience than, say, ‘Rear Window’: I liked EVERYONE in that film, …including Thorwald. But as for ‘The Birds’: It’s a testament to Hitchcock’s brilliance that a movie in which I don’t care about anybody is still so scary, compelling and memorable. Great post about those dirty birds! Very entertaining and especially well done. 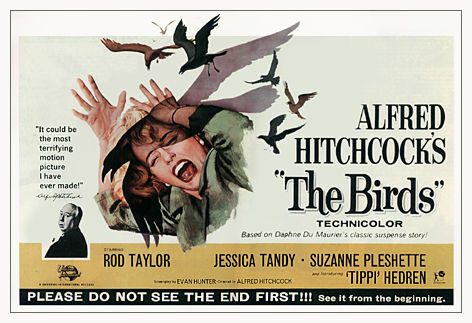 And yes, because of Hitch, those darn birds are in our heads forever. Fantastic review!! You’ve thought of so many things/analogies I would have never noticed (I never was good about thinking deeply about something, just how I feel). I just read about “The Birds” in a book on Edith Head by Jay Jorgenson. It said that the morning of the scene when Hedren goes in the attic (why is she so stupid?!?) they told her they were going to have to use trained birds. They had a big cage and the handlers threw the birds at her. She got a couple of real scratches. A wardrobe lady stood by with a pair of scissors to cut up the dress as it went along. When the scene was over, Hedren cried for 2 hours and then was put to bed for a couple weeks to recover – doctor’s orders. Great choice of film and villain. I like your distinction of being afraid “in their stead” — not for the characters. Great choice and great post, love that you did another Hitchcock too. Unforgettable once you see it. So true about the claustrophobia of it too, they’re oppressive and to me, always said something about the danger of groupthink too. Thanks so much for joining us again this year! I’ll be back next year. Count on it! Great review. Couldn’t agree with you more about the annoying quality of every character in the film. That’s why I ultimately found the short story creepier, wonderful as this film is. I love du Maurier. A long time since I’ve seen this, but I definitely remember how scary it is. Great piece. I have to admit, I’m afraid of pigeons, but I LOVE this film! This is the first Hitchcock’s film I saw and I watched it many times since. What amazed me the most in this film was the editing in the attic’s scene. Simply incredible. Thanks for the great review! And how funny, these times I felt like watching The Birds for the 1000th time!